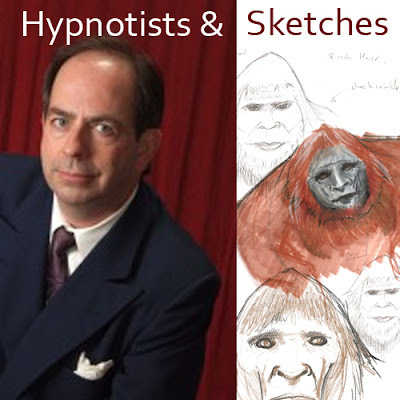 Certified and Registered Hypnotist, Doug Meacham will present his findings at this month’s HopsSquatch, Bigfoot and Beer Speaker’s Series. Frank has had two significant Bigfoot encounters; one at age 10 in New York and another, almost face-to-face, was at the age 16 in Oregon. Hypnotist Doug Meacham has been able to help Frank retrieve incredible details including hair patterns and behavior. Several forensic-quality sketches of what Frank witnessed will be available at HopsSquatch, Sunday August 25, 2013 at the Lucky Lab Brew Pub, 915 SE Hawthorne Blvd, Portland, OR 97214 from 2-6pm. Doug is a hypnotist in Gresham, Oregon and a member of the American Board of Hypnotherapy. During his presentation at HopsSquatch he will explain what Hypnosis really is and provide examples of how it has been used in the past and share his new ground-breaking process with a two-time witness. This month’s event will include a presentation with Doug, a moderated question and answer period, previews of upcoming Bigfoot movie “Bigfoot Chronicles,” over $100 of cool Bigfoot swag and the chance to socialize with Bigfoot enthusiasts. This month’s event is sponsored by Off The Charts Games, Missing Link Toys and Ripley’s Believe it or Not. Don’t miss your chance to be a part of this historic event. Limited space available, only $5 per person to attend. Reserve early so you don’t miss out. For more information, please contact Guy Edwards at GuyEdwards@BigfootLunchClub.com, 503.929.7436 or register online at HopsSquatch.com. About HopsSquatch: HopsSquatch is a unique speaker’s series bringing together Bigfooters and those that want to know, in the relaxed atmosphere of beer and camaraderie. (limited seating so reserve early!) 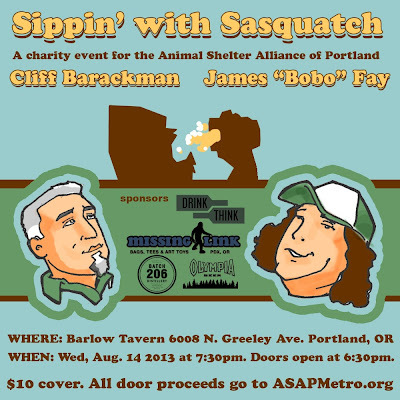 or save by becoming a member of HopsSquatch for $50. Membership includes a seat at each series event, a Hopssquatch t-shirt, first chance at news and speaker updates, and more. 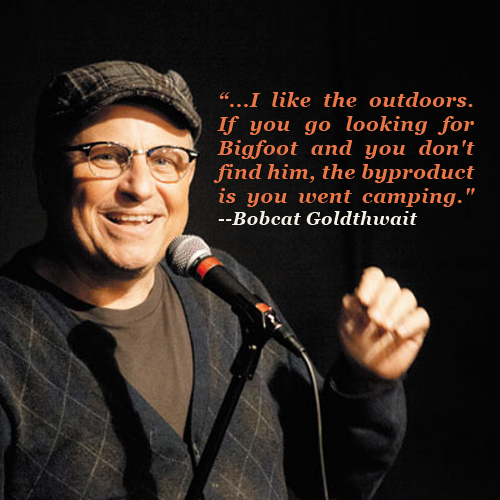 Bobcat Goldthwait understands what Bigfooting is all about. Recently while promoting his stand-up performance for this weekend (Friday, Aug. 16, and Saturday, Aug. 17, 8 p.m. and 10 p.m.) at the Liquid Lounge in Boise, ID, Bobcat Golthwait talked about his recent found footage Bigfoot movie Willow Creek. [Bobcat's] latest, Willow Creek, is currently making film festival rounds and is probably his biggest step in a different direction--not only from his early stand-up, but from the canon of his film creations: Willow Creek is a found-footage film about Bigfoot. And although it is not without humor, Willow Creek, is definitely a horror movie. "It's a scary movie. It's a departure from my other movies. There's comedy in the beginning but then it goes pretty straight-up horror," Goldthwait told Boise Weekly. Willow Creek, which was shot on location, is about a couple who hikes into the remote woods near the small hamlet of Willow Creek, Calif., searching for the site of the famous Patterson/Gimlin footage--the few seconds of grainy film showing a giant, hairy man-like creature walking through the trees. Comparisons to Blair Witch Project are inevitable. Found-footage is a well-trod genre and Goldthwait's film contains the standard ingredients: young people, scary place, mythical creature. Goldthwait said he knows the found-footage format is kind of played out, but his take on it is different. "I only have 67 edits in this movie," Goldthwait said. "Usually you have 1,200-1,400 in a movie, but I wanted it to feel like they really were just turning the camera on and off." "I think sometimes in found-footage movies, they don't concentrate too much on the chemistry of the [characters]. And that was really important to me--that you believe these are real people," he said. That authenticity was important to Goldthwait, which might be an odd thing to consider in the context of Bigfoot, but makes perfect sense considering Goldthwait's longtime love of the legend. "I took a Bigfoot vacation," Goldthwait said, with no trace of irony. "I actually put 1,400 miles on my car just driving around to all the famous Bigfoot sites in California. And when I got to [the community of] Willow Creek, I was kind of thinking of a different movie. But when I got to WIllow Creek, this just seemed to be the movie to make because of the people I met there. And I found the town very interesting. "The other thing was, I always wanted to try my hand at a suspense movie. I'm always jealous when I watch a Tarantino movie and you're at the edge of your seat most of the time and there's nothing going on. I'm like, 'How do you do that? How do you make suspenseful stuff?' That was my goal." Indiewire.com called it "the monster movie of the summer," adding that the film is "a unique representation of the tension between those who scoff at the Bigfoot legend and others willing to accept the mythology as gospel." Fearnet.com said Goldthwait's film "is a refreshingly matter-of-fact horror/thriller ... a calm, cool, creepy little winner." While Goldthwait has no plans to retire from stand-up, it's anyone's guess what Willow Creek may mean for his career. Regardless of what happens, he has a new subject to mine for stand-up material and, in making the film, Goldthwait learned something about himself. "[The vacation] was a gift to the 8-year-old me," Goldthwait said. " I've always been fascinated by [Bigfoot] and what it represents and how it shows up over and over again in so many different cultures. And it took me a while to realize it, but I like the outdoors. If you go looking for Bigfoot and you don't find him, the byproduct is you went camping."